Only in Britain! 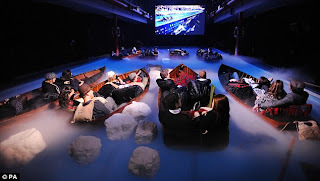 Movie goers in London got to dive into the movie 'Titanic' like never before! Take one swimming pool, fill it with wooden life boats, mini icebergs and then invite your audience to dress the part in costumes from the early 1900s. A HD screening of the movie completed the picture. Now you have the setting for this latest exhibition of 'Titanic'. You have to admire the originality in creating such an on-theme viewing experience. But just one question? What happens if you've had too much pop and need a wee? LOL. I put this on my blog this morning. I don't steal. Promise. Its mental, I wouldn't be able to cope. Sitting in a boat is uncomfortable as it is but sitting in a boat and watching a movie?? I think it might be a good experience so I rate it. Why would anyone want to experience a boat sinking???? Yeah, I'm going with silly. Just plain silly. On one hand, I think I would love to try it. But on the other hand..... I don't know. I think that we can wear costumes and all is cute. But how much does it cost to go? That would pretty much decide whether I like it or not.